Perfect for made-to-order manufacturing or a series of complex parts, direct metal laser sintering is a key benefit when looking to conquer new markets. Using 3D files, your model is reproduced by stacking layers of metal powder sintered under the action of a laser. These layers can be up to 20-microns in depth, providing a highly detailed resolution. We have one of the highest production capacities in Europe for improved reactivity. Choice of high performance alloys with technical implementation. 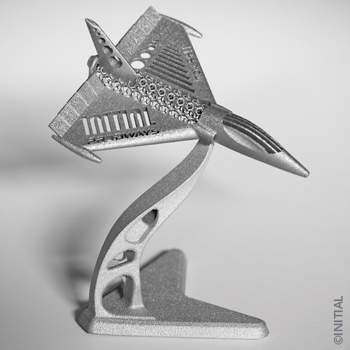 An essential complement to standard machining, metal additive layer manufacturing (ALM) enables production of one-piece, complex metallic parts with geometries which cannot be manufactured otherwise (control, transfer of fluids, etc.). This technology, resulting from rapid prototyping, offers a competitive alternative to standard manufacturing processes. At present, there is a wide range of materials available, which offers more freedom during the design phase. Conformal Cooling : Temperature control to remain as close to the design as possible. We use Direct metal laser sintering, which is a revolutionary technology, to produce parts which were previously “impossible to make”, using CAD data-STL files – and without tooling. DMLS is an “additive” technology which functions by casting very fine layers of metal powder using a laser. Metallic powder beads are cast locally at the point of laser impact. As they re-solidify, they form a horizontal layer, and are cast on the lower layer. It is then possible to create internal cavities and undercuts. The depth of the layers varies between 20 and 40 microns. The resulting tolerances are highly accurate: +/- 0.05 mm. Direct metal laser sintering is a technology in its own right, not simply a substitute. Parts must therefore be designed taking into account all potential benefits and manufacturing specificities. Laser sintering is similar to welding; the parts are manufactured on a plate and are then detached using electro-erosion or sawing. There is subsequently a post-process phase which may be complex, and often delicate. As the technology uses welding, the possibility of inner strains which may cause warping must be anticipated. Entrust the design or re-design of your parts to our team of experts. This will give the best opportunity to ensure relevant results.